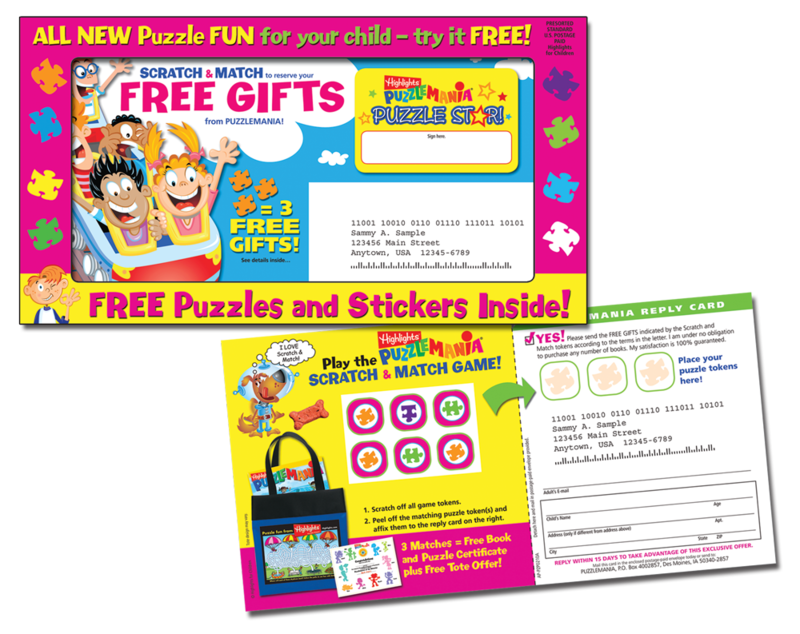 Direct mail promotional materials for Highlights for Children would often involve creating a 4-page sampler with art and games directly from the featured magazine, as well as the actual direct mail offer/response piece. This package launched the newly-redesigned Puzzlemania magazine. We adapted a previously-used format and updated artwork and text to reflect the art and energy of the new publication. As part of the process, I had to pull page spreads and incidental art files from publication PDFs, adapt puzzles used in the magazine to fit the sampler format, and balance variety and energy with consistency across all pieces of the package. This particular package had a sampler with stickers that needed to be set up for die-cut, along with an offer/response card that had a separate membership card and scratch-off stickers that needed to be precisely placed for production. I also had to allow for room for inkjet addresses to be placed correctly so that each piece would fit and function correctly within the mailing and reply envelopes. Responsible for: Layout and design of all elements of the package, making edits and mockups for proofing rounds, preparing files for printing.